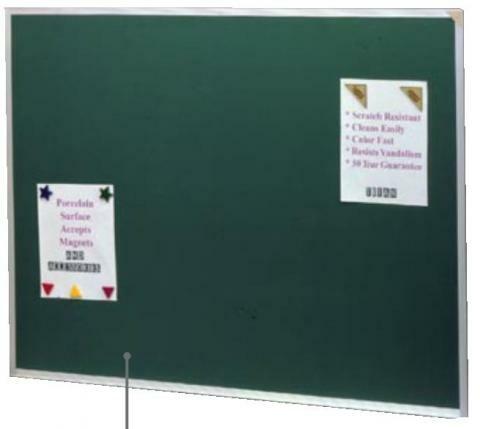 Magnetic School Blackboard with 50-Year Manufacturer Guarantee. This blackboard is constructed of Porcelain Enameled Steel with 1/4" Hardboard Backing. Porcelain-Enameled Steel is the best quality blackboard surface available. It resists scatching, ghosting, and fading. The manufacturer guarantees it for 50 years. This magnetic blackboard also doubles as a magnetic bulletin board for your classroom and comes in Green (recommended). Choose from either an Aluminum or wood frame. A full-length chalk accessory tray is included.